Traditional water stones need to be soaked in water prior to use. Normally about ten minutes, or until bubbles no longer escape from the stone. If you've ever used sandpaper, you know that the paper becomes smoother with use. A Traditional Japanese water stone is designed to wear as you use it, thus exposing fresh particulate and producing a very consistent grind all the way down. 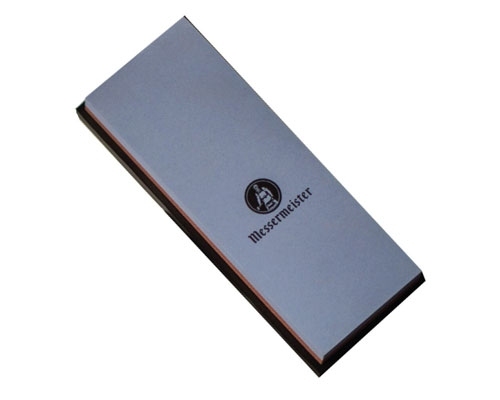 A slurry or mud will form on the stone which aids in the sharpening and polishing process. This should be left on the stone while sharpening. Dimensions: 2-7/8 in. W x 8-1/8 in. L x 7/8 in. thick. Excellent finishing stone for a mirrored polish. Pricing goes up on these high-grit stones, but the good news is that they last much longer than, say, a 1000 grit. This is because the substrate, or bonding material is much harder as is required to produce a mirror finished knife edge. This 600 grit stone takes metal down fairly quickly. Useful in thinning a blade, repairing micro-pitting and re-establishing an edge on a very dull knife. We recommend these larger, Masahiro stones with attached stand. They are premium quality and long lasting traditional water stones. We love the finish derived from this 3000 grit fine stone. It doesn't "load up", cuts quickly, develops slurry fairly easily and puts a finished edge on a knife that is comparable with other brands of much higher grit. Highly recommended. 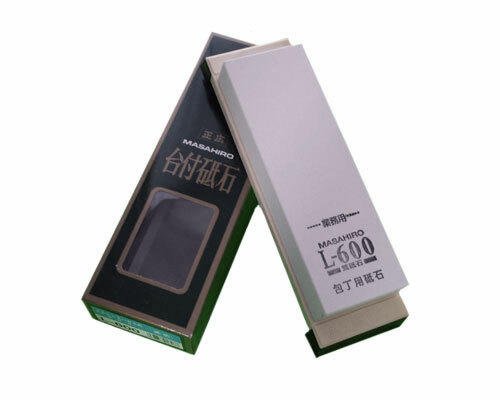 The Masahiro 1000 grit stone is perfect for establishing an edge on a dull knife. 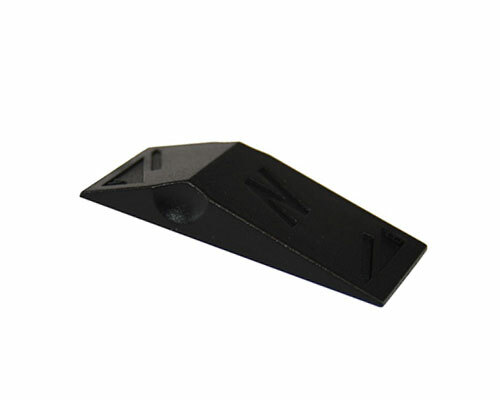 If you were to purchase just one stone for all your knives, this should be your choice. It cuts quickly lasts a long time and leaves a slightly toothy edge that will shave, yet bites right into tomato skins. General sharpening may be done with this stone, hone off the burr and you are back in business. 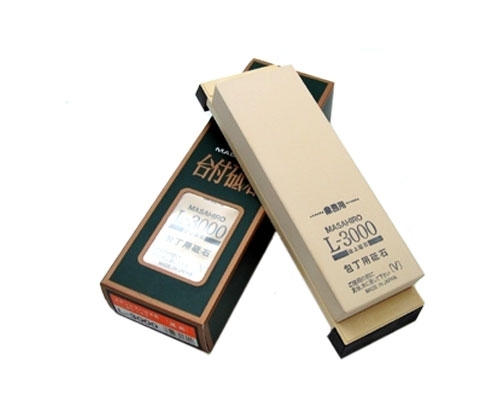 Mercer 1000/3000 Grit Waterstone is used for basic maintenance on knives. 1000 grit on one side for the main sharpening, 3000 grit on the other to finish. The Messermeister 1000/3000 Combination Waterstone features a medium 1000 grit side that is used for maintaining your knife's edge, and a fine 3000 grit side that is for finishing the edge. 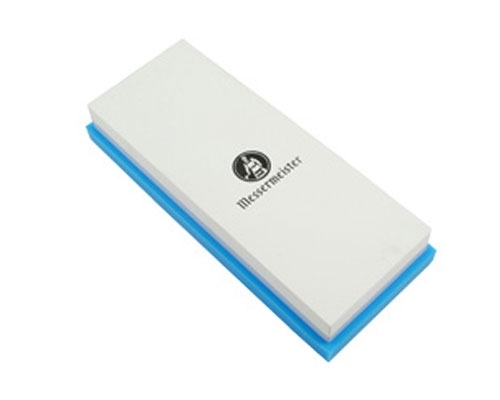 Messermeister 120/240 Combination Water Stone is Coarse and Extra Coarse, for Experienced Professionals only. This is ideal for removing chips and re-profiling your knives. The Messermeister two sided 2000/5000 Combination stone works perfectly for anyone who wants their kitchen knives to be razor sharp. The 2000 grit side is used for maintaining the sharp edge, while the 5000 grit side is used for finishing the sharp edges with a polish. 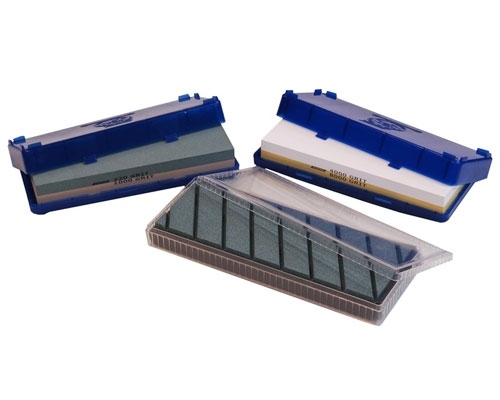 Messermeister 400/1000 combination stone is ideal for working on chip repairs, re-profiling and basic maintenance. 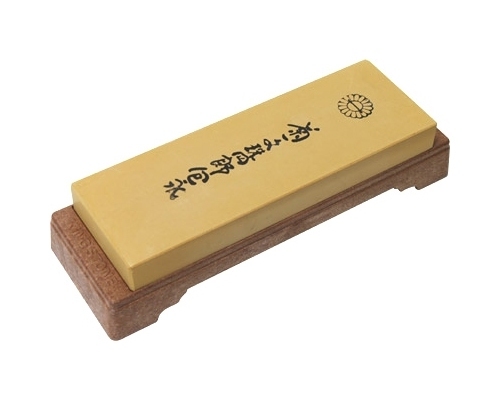 The Minonokuni 1000 grit waterstone is the most commonly used grit waterstone. 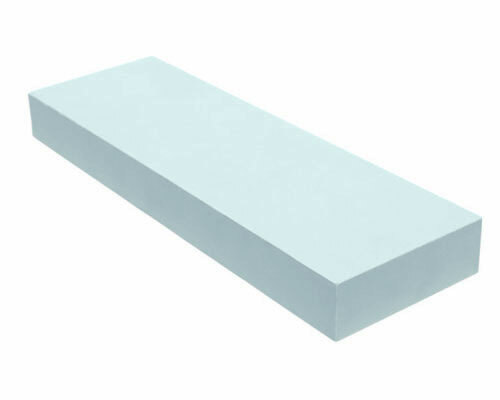 This stone is intended for daily maintenance and establishing an edge on a dull knife. Needs to be soaked in water (usually until the bubbles stop) before use. 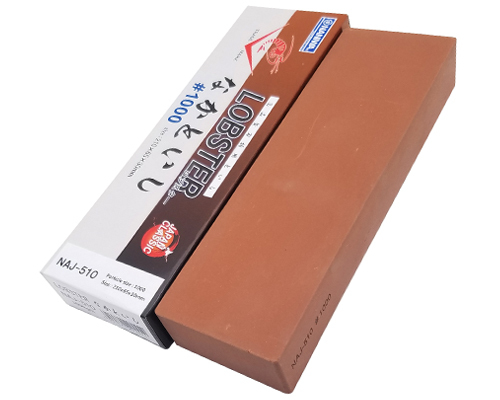 The Naniwa (Lobster Brand) 1000 grit waterstone is the most commonly used grit waterstone. 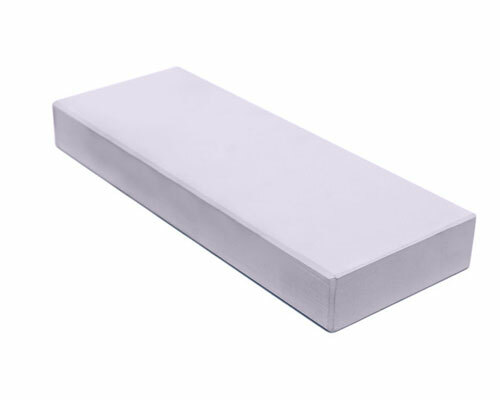 This stone is intended for daily maintenance and establishing an edge on a dull knife. Needs to be soaked in water (usually until the bubbles stop) before use. Norton 1000 grit waterstone is a full sized (as opposed to a combination stone) and should last a very long time. This is the grit you would use to establish an edge on a dull knife. If you were to purchase just one stone, 1000 grit should be the choice. 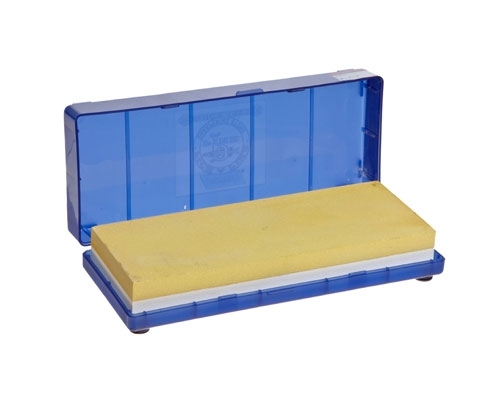 The plastic case has rubber feet on the bottom and notches at the top to hold your stone securely while sharpening. I also soak my Norton stones directly in the plastic case. Dimensions: 8 x 3 x 1 in. These stones vary from the Japanese in two key areas. The bonding agent is softer than a premium Japanese stone. I don't know that they actually wear faster though, because they produce results much more quickly. I really like the finish produced by the 4000 grit and we use it regularly. We actually like these stones quite a bit. 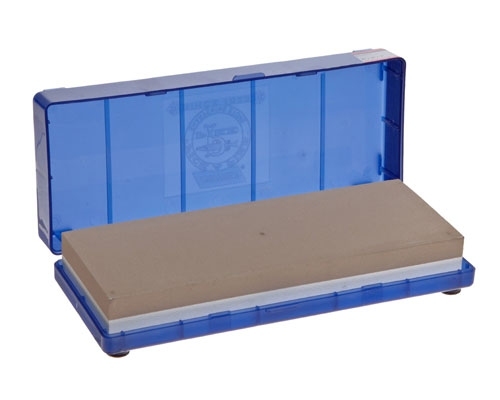 Nice size, sturdy plastic box that also serves as a stand for the stone. Be very careful to not push the edge into the stone. Draw the knife towards you with the edge facing away. Please call or email with any questions. 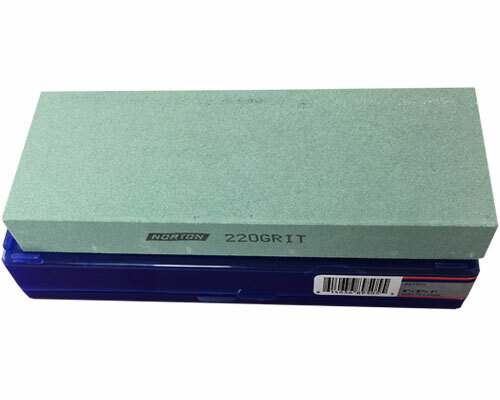 The Norton 1000/8000 Grit Combination Waterstone creates an abrasive slurry during use, for effective sharpening, and less pressure than oil stones. The 1000 grit is fairly course and should be used to fix minor chips and dings in the blade. The 8000 is used for a high degree of polish on a knife. 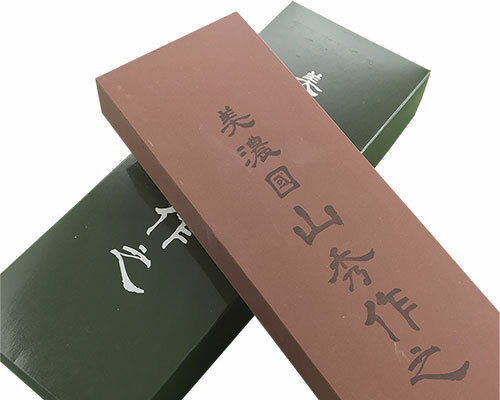 Generally, stones in this range are used on traditional Japanese knives to smooth grind marks along the shinogi line and minimize drag. For general use like cutting tomatoes, this may be too high a degree of sharpening. When slicing meats and fishes you benefit from this mirror finish sharpening. 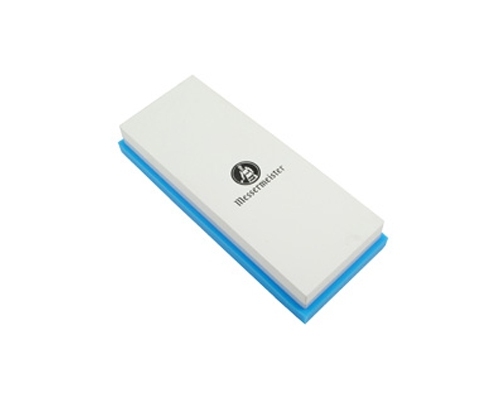 The blue plastic box features rubber feet, and can be used as a holder during use. Norton 220 grit Waterstone is 8x3x1 inch Waterstones are for experienced sharpeners. A stone in this grit range is used for tip repair, chip removal and blade thinning. The Norton 220/1000 Grit Waterstone is one of the stones found in the Norton Waterstone starter set. This stone has two sides; 220 grit is for fixing nicks and dings on your knife, where the 1000 grit side is used for reestablishing the edge. Norton 8x3x1 inch, full size 4000 grit waterstone is used to polish and refine the edge of an already sharp knife. Generally used to remove grind marks left behind from coarser grits used in initial stages of sharpening. 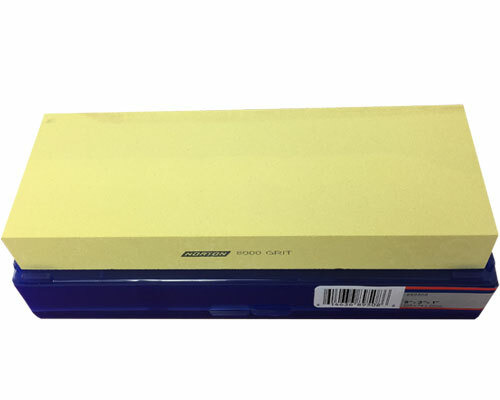 The Norton 4000/8000 Grit Combination Waterstone creates an abrasive slurry during use, for effective sharpening, and less pressure than oil stones. The 4000 grit is for maintaining and refining your blade's edge, and the 8000 grit is for polishing. Cleans up easily with water. 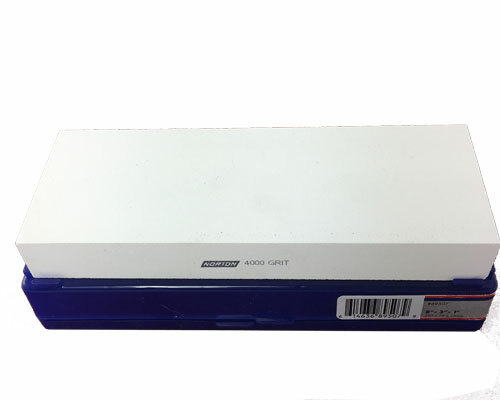 The blue plastic box features rubber feet, and can be used as a holder during use. Norton 8x3x1 inch 8000 Grit Waterstone is used for a high degree of polish on a knife. Generally, stones in this range are used on traditional Japanese knives to smooth grind marks along the shinogi line and minimize drag. For general use like cutting tomatoes, this may be too high a degree of sharpening. When slicing meats and fishes you benefit from this mirror finish sharpening. The Norton Sharpening Guide is a measurement tool for knife sharpening, to help the sharpener determine the correct angle for the knife being sharpened. This guide shows angles for both Japanese and German knives. Included with the knives is a packet on sharpening instructions written by Norton Abrasives. - Dimensions: 9 in. x 3 in. x 3/4 in. - Coarse grit silicon carbide stone. - Superbly flat with hard bond. 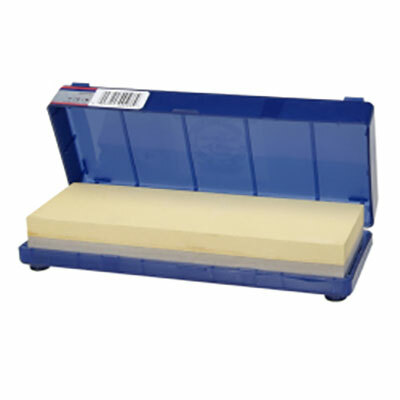 - Promotes maximum cutting for all grit sizes of water stones. - Produces extremely flat results on all water stones, ceramic or traditional. Soak the flattener in water for at least 10 minutes prior to use. Pride Abrasive 3000 grit Waterstone (grey) 5 micron. Made in the USA. 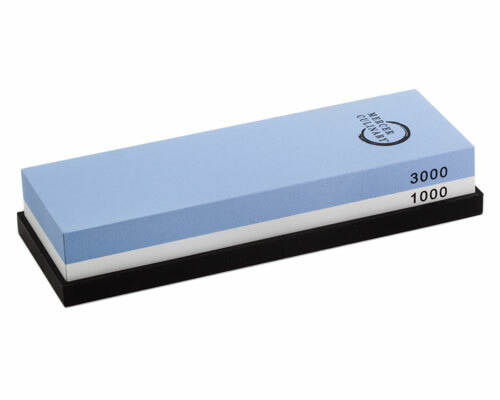 Use this 3000 grit stone for general knife maintenance and preparation for polishing. For a knife that is losing it's edge, but not overly dull; this stone does a great job for the quick touch-up. Otherwise used after the 1000 grit to refine an edge. Pride Abrasives 1000 grit Waterstone (cream) 14 microns. Made in the USA. 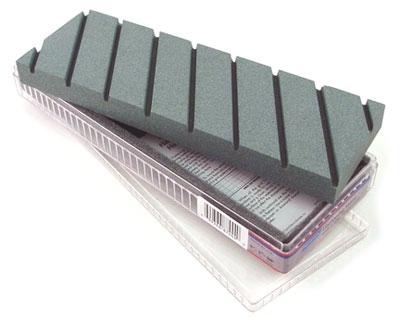 Pride stones use a unique vitrification process on the Aluminum Oxide, ensuring these stones form a burr quicker and stay flatter longer. 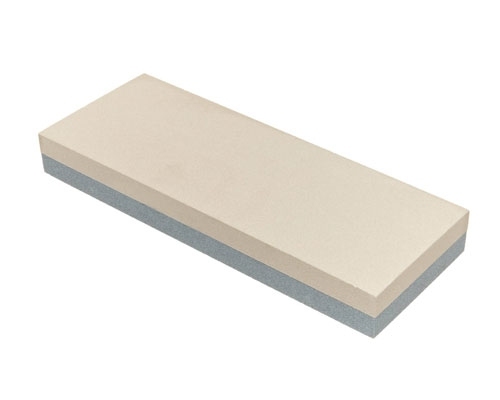 Use this 1000 grit stone for general knife maintenance and to bring the edges together to form a burr. 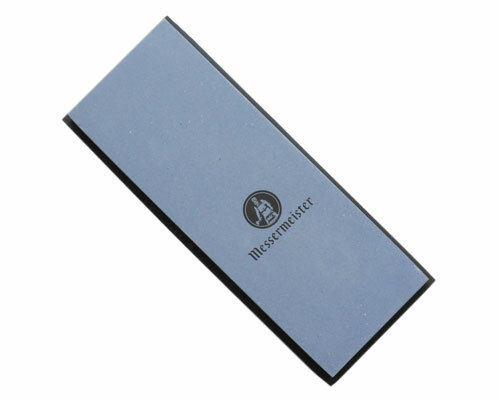 Pride Abrasives 600 Grit Water Stone (slate/blue-grey). Pride stones use a vitrifed bonding process rather than resin. This is particularly helpful on these lower-grit stones where most brands create excessive slurry and bread down quickly. These cut aggressively, yet maintain flatness very well. 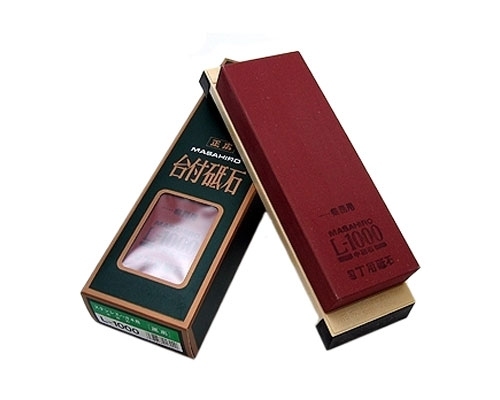 600 grit iscommonly used to repair minor chips, and prepare the knife for higher grit stones. Pride Abrasives 8000 grit Waterstone (white) 2 micron. Pride stones use a unique vitrification process , ensuring these stones form a burr quicker and stay flat longer. 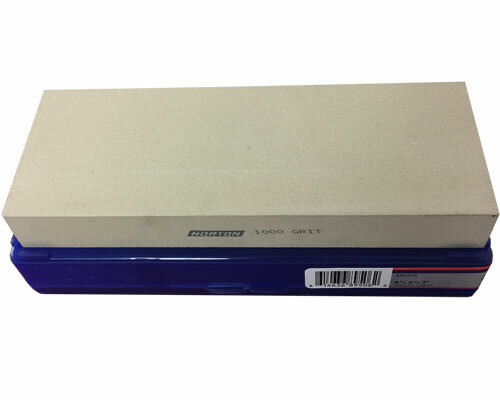 Use this 8000 grit stone for final product polishing as this stone will smooth and mirror polish the knife edge.